Note: If you are making a Content request for us, it will be a plus financial charge! You can request a Content in the Editor with the plus, and ’Request a Content’ button. There will be a pop-up Contact message where you can describe to us your request. – If it is a specific content, please describe what are you wish in the Content for example Preview, Sales, promo, or activities etc. – Do you wish a demo or a full made Content? – If you check the Templates, and you find one what would you like with some differences we could customize for you. Just write the name of it. After that, you click on the send and our team will gain your request, and we will contact you. If you do not wish to use the Editor Content request, you can write us to the support@wallboard.info email address. 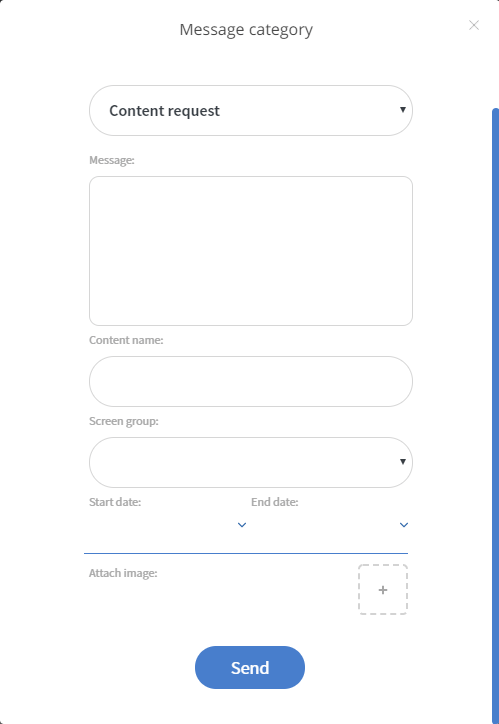 If you have specific, non-publish pictures videos what you wish to use for the Promo Content, you can attach the pictures and a link for the video to the email.